Cointreau Global Travel Retail has teamed up with professional nail care specialist OPI Products in a special promotion for global travel retail. 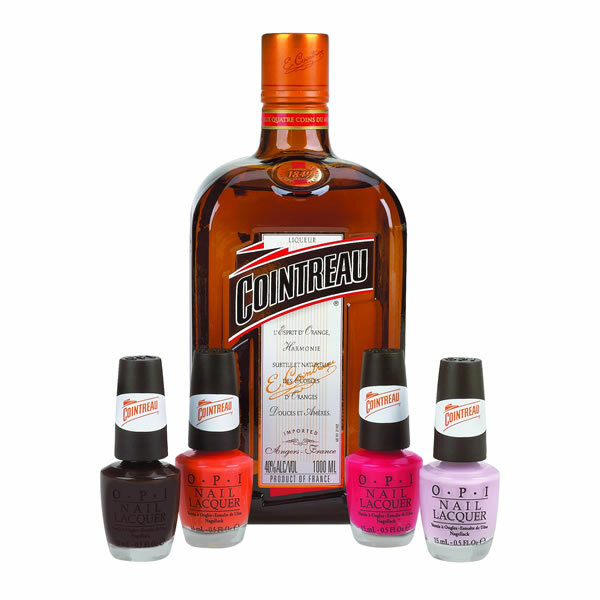 For every 1-litre bottle of Cointreau purchased in one of 15 key travel retail locations, the customer will receive an OPI nail lacquer in a Cointreau-inspired shade as an exclusive gwp. The OPI Cointreau shades include Have You No Self-Cointreau? (a bright pink), Cointreau-versial Chocolate (a rich brown), Sweet Sips At My Fingertips (a pale pink), and Orange You A Seductress (a vivid tangerine). The partnership was unveiled first in April at Auckland International Airport. Over the coming months the Cointreau nail lacquers will also be found at Paris Charles de Gaulle, Munich, Mumbai, New Delhi, New York JFK, Newark, Orlando, Dallas, Houston, and San Juan Airports. They will also be on board Condor Ferries between England and France and in selected border stores in Ontario and Quebec at the U.S. border. Frankfort and Moscow airports will participate in the Cointreau OPI Cocktail Collection promotion later in the year. Interesting! I thought Cointreau sounded familiar and I asked a friend immediately what it was and laughed at the response. :D I couldn't remember if it was soap or alcohol. Intersting partnership. this is really interesting. I hadn't heard of this! I think this is an interesting pair!! Love the colors!! I'm having a Konad Giveaway at my blog! Wouldn't it be nice to pick this up at the Charles de Galle Airport?! Guess I won't be getting these polishes! Glad blogger is back. I knew I'd heard of Cointreau before,just didn't remember what it was. I kept thinking it had something to do with New Orleans and jazz music. LOL! I think the polish names are really cute but don't see myself having access to them in the venues being sold.